The Burton Green Scarecrow Competition 2014 is open to all. There is no theme. Entries should be submitted for registration on Saturday 28th June between 9am-11am, at the Village Hall (CV8 1PH). The display will be along the Greenway from Cromwell Lane Bridge to the National Grid Wood entrance (towards Berkswell). 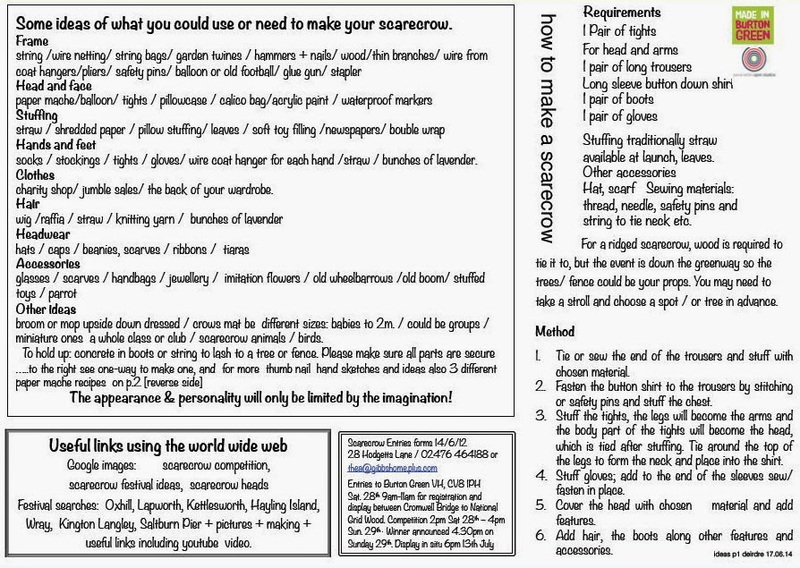 The voting for scarecrows will take place from the Saturday 28th, 2pm until Sunday 29th, 4pm. Voting slips will be available at the Village Hall. The winner will be announced at 4.50pm, Sunday 29th June. 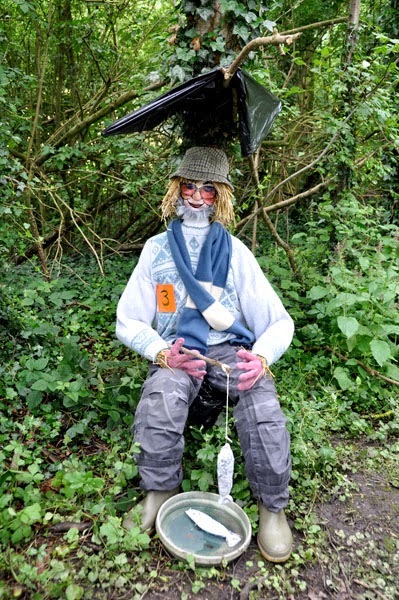 Scarecrows will remain in situ until Sunday 13th July, 6pm. This will coincide with the Warwickshire Open Studios 2014 events across the county. Please note that a community trail will also be in place within the National Grid Wood between the Greenway and Hodgetts Lane, Burton Green. 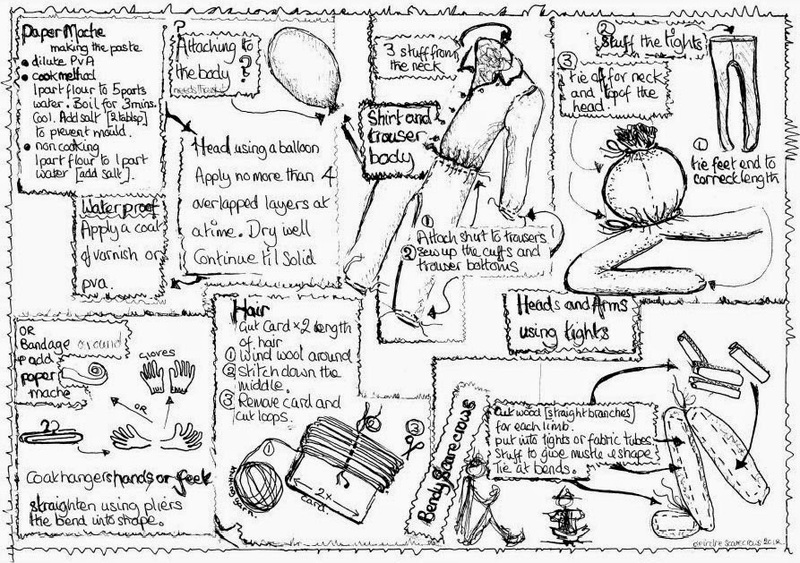 This is a slideshow of entries in the 2012 Burton Green Scarecrow Competition. Burton Green and the HS2 compensation scheme was featured on BBC Coventry and Warwickshire Radio on 10th April. There was a report by Jenny Scott (CWR reporter), and an interview involving Martin Beckett (a local resident) and Baroness Kramer (Minister of State for Transport). 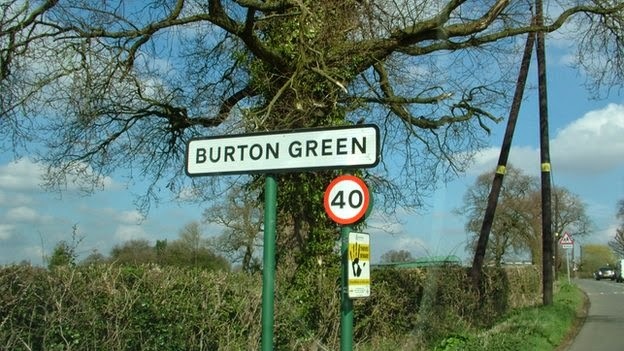 The interview sections about Burton Green commence at 7 minutes into the program, and at approximately 1 hour 7 minutes. You can advance the cursor to those positions. That repeat is available only until 15th April. The Parish Council currently has a casual vacancy for a Parish Councillor. This is a wonderful opportunity for someone who is interested in their local community, would like to represent the residents of Burton Green and become involved in current issues affecting the parish. Anyone who is interested in becoming a Councillor can find out about what is involved by contacting the Clerk to the Parish Council, who will be able to send a copy of the eligibility criteria. There are also two very informative booklets entitled ‘All about Local Councils’ and ‘It takes all sorts’ which can be found on the ‘Publications’ section of the Parish Council website (www.burtongreenpc.org.uk). Anyone wishing to apply should check they meet the eligibility criteria and write to the Clerk of the Parish Council with their expression of interest by 28th April 2014, with a copy of their CV and a short statement about why they would like to be considered for the role.